Floor Standing, Wall Mounted, and Recessed Trophy, Store, and Memorabilia Display Cases. Custom Display Cases Available. 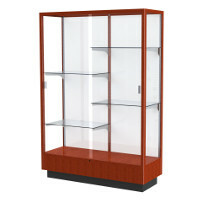 A glass display case, especially sports display cases and collectibles display cases, is an excellent way to showcase the achievements or collections of your school, organization, business, or home. The possibilities of a display case are endless, adding prestige to both the collection and the room it is held in. The sports fan can be the talk of the town with his or her jersey display case, basketball display case, baseball display case, or football display case. It will be your shrine to the team you love or the team you played for.Our display cases for trophies, memorabilia and merchandise put the spotlight squarely on your favorite items, from your child's awards to your jewelry collection. Display jerseys, trophies, posters, collectibles, flags and other valued collections in a secure wall-mounted or floor-standing case. Browse your selection to find the right frame and style to match your office, hallway, or exhibit room. Brite Inc can make a custom display place, including an elegant wooden display case or acrylic display case, that fits both your style and the dimensions of your room. A wall display case is ideal for when space is limited or the walls need that extra something. You can enhance whatever you collect, whether it is with a shot glass display case or any other type of memorabilia. Both private and public spaces can benefit from one of these high quality offerings from Brite Inc. A trophy display case allows the public to witness the achievements of a high school or organization, and a store display case effectively showcases specific products they sell. The possibilities of a glass display case are nearly endless. From sports display cases to collectibles display cases, Brite Inc will create the perfect opportunity to show off your achievements and collections.